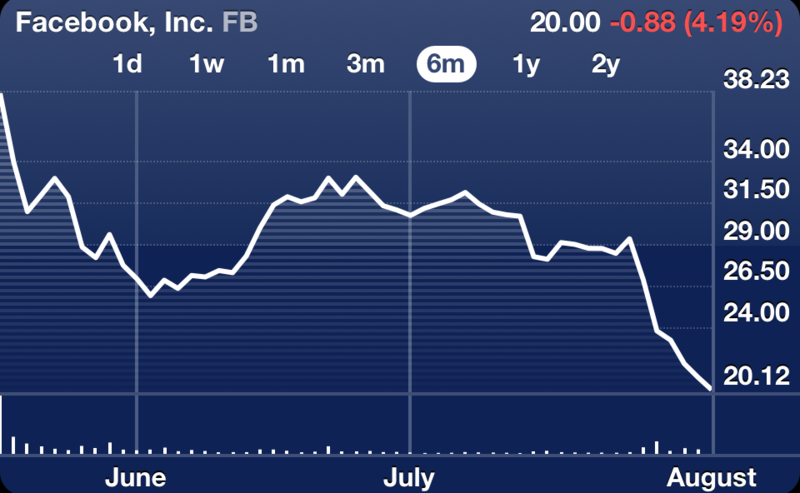 Facebook (s FB) stock has dropped to around $20 a share, almost half its IPO price. The social networking company has seen its valuation tumble to around $38 billion (according to Yahoo Finance). The stock market has soured on social networking stocks including Zynga (s ZNGA) which now trades for $2.71 a share and has a market capitalization of $2.08 billion. Shocking news…Facebook has a bright future ! Wow! What this recent stock price performance confirms is that Facebook as a company has material risks that are not reflected in the valuation being asked for. PrivCo places fair equity value for Facebook at just $24.60/share (rounded to $25/share), and that was in May based on conservative projections (by then standards) that Facebook is actually now MISSING. While early private investors in Facebook made out well, the risk-reward on Facebook probably isn’t there for new investors entering above that point. I have posted a similar comment on many other financial web sites and I think this is the most important thing to take away from this whole experience. Sure facebook is overvalued right now with total number of shares playing some part in how we relate profitability to a companies stock value. I like to think of facebook as a “utility” company much the same as any other that we have today. We may not understand all the complexities of but we can all agree that some type of larger social network will exit in the future and it will allow us to connect in ways that we do not fully understand right now. Just like the electricity companies almost a century prior, no one is going back to a time with out air conditioning, heating, and refrigeration. I am neither for nor against facebook. Personally I do not use the social portal. Whether facebook survives or not is not the right way to understand this industry. Large ideas about how society work are changing. Some ideas about who and what we are take a lot of time to manifest and others ideas materialize almost instantly. Social Networking has only really existed for a few years at best and it is doing quite well. I think we may find that in the near future it will not be question of how well this one particular company is financially, rather it will be which of these type of networks serves us in a way that makes social networking compatible for us. We going to a more connected future that has social networking. You could not say that about a lot other industries early in their adoption because either enough people ultimately did not buy the product or the producer could not keep upgrading it. I know its hard to compare facebook to an automobile but just about the conditions that the automobile first had be adopted under. Poor or no roads, slow speeds, no safety features, It came in one model, and it was expensive. Think about the start of aviation. Wow!!! A lot of people said no way about aviation but here we are today and we could never live with out it. Social Networking as we know it now will evolve and I think facebook will do just fine. It may not be the best or the biggest social networking company in ten years. Who cares, the important thing is the innovation it will bring to the market place. If I had to make a guess as to what would be some of the dominate parts of social networking in the future it would be these: A way to share ideas (content) through an interface that connects you to larger group of people and even other AI’s, video on demand that connects you other people in your own country and all the others, and way for you create smaller private networks on demand as needed. For example, lets say you are working on coding a program but you have come difficult spot. You get on a social network and withing a few minutes thousands of people are interested in sharing in some profitability to help you complete your code. We used to do this with news papers hr departments and a lot of other mechanization. How many people open a phone book any more? So many people that Donally is phasing out the paper book. So that right there should give you an idea about how this industry is evolving. Is Facebook stock similar to Priceline in 2000? media megaphone like TV, Radio, Cable, …Look at Pintererst/Instagram/Twitter…etc etc… Yeah, the Facebook stock may take a few months or years to get a strong bottom in place… but , do you honestly want to go against 900 Million+ 18-24 aged users who LIVE on Facebook??? The recipient user, controlling the message is happily our new reality, ( youtube ) … If you need a strong dividend , yield in a stock , buy maybe Capstead Mortgage, or Analy Mortgage, CMO / NLY and lock in your 10%+ return per year dividend yield. Do you honestly want to rely on 900 Million+ 18-24 aged users, many of whom are tiring of Facebook and may be moving away from it? Sorry, but Priceline and Facebook are so different that Priceline is not a correct way to evaluate Facebook. Agreed: Priceline and Facebook are two entirely different business models. Which demographic does advertising live and die for , the 75-99 Year Old Fox News Viewers? No… All advertisers stay up at night trying to figure out how to appeal the 18-24 year old crowd, who , unlike old codgers like me… buy a HECK of a lot more stuff than I do. Yes, PCLN is a different market, …and some genius convinced William Shatner to SELL ALL of his Priceline , when it was under $3.00 a share.. WOOPS! If you can’t see the similarities of Social /Internet companies that people actually go to…maybe you’d be better off buying…say …Ford, Berkshire Hathaway /Proctor and Gamble.. If you see another 900 Million + users , please let me know…because General Motors couldn’t agree to keep their yesteryears advertising money going to the Super Bowl’s 117 Million ONE Day’s viewers…so where does most of the suggestion now go to ? A company’s Twitter page, Facebook Page, Pinterest page. Oh…and you may need to wait more than 1 day or 1 year for FB stock to “perform” or get back to what the NASDAQ did to mis allocate FB. The public already voted…900 Million viewers+ switched off dying media outlets and do things that are relevant to their lives, their friends, their families…Facebook is one of those major portals …and their just getting started. The stock didn’t turn out to be Netscape!!??? Maybe it never will…but why go against the TREND 900 Million users… Would you rather be happy , or would you rather be right? You can be “right” and say that , FB is an unproven business model…and watch another 100 Million users sign up for it…to do things that are relevant to their lives. It’s Free at it’s best…the sales method that Google wisely adopted with Android years ago … The trend is your friend. I still don’t “feel” like Zynga is valued correct even at $2.71/share. I saw a financial post the other day that without accounting magic they would have had a loss each quarter. %80 + of FB revenue comes from ad revenue. Which I question the effectiveness. How do you grow that with your user count? I don’t know…. That’s why I’m an engineer. I’m in the same boat as you – I don’t know how these companies are valued the way they are without accounting shenanigans. I guess that’s why I’m not in finance. There was a video that was shared by Bloomberg that shows the problems with Zynga’s accounting and I think a lot more people are essentially questioning that company.